My name is Anne-Marie Joffrin and I took over the responsibility of voluntary Curator in 2015 at Dorchester Abbey Museum (Dorchester on Thames, UK). I became an affiliate member of the South East Museums Federation a few months ago and had the privilege to join the Study Trip 2018 in Cologne. SEMF offers many opportunities to exchange knowledge and expertise with other professionals, freelance consultants, mentors and volunteers from different environments. These few days visiting museums and exchanging with other participants were particularly enriching. In addition, as new member I felt particularly welcome. We visited four museums in two days. The Roman Germanic Museum was particularly interesting. Indeed, Dorchester village lies over an old Romano-British walled town, which later became a Saxon settlement. Following many excavations of the Roman town through the ‘Discovering Dorchester-on –Thames Project’ (Heritage Lottery funded) the Museum treasures a few exquisite pieces in its collection. The Roman Germanic Museum was created in 1974 at the very place where the Dionysos mosaic was excavated. Colonia Agrippina or the Roman Cologne left numerous artefacts, one of which is the impressive main entrance arched gateway you can admire upstairs in the Museum. 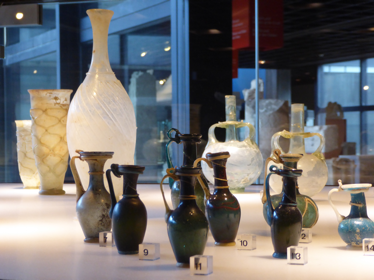 The unique collection of Roman glass artefacts will remain the most amazing objects I’ve ever seen. Our Guide Christina Kempcke-Richte was very engaging and knowledgeable. The second museum we visited was the Museum Schnütgen in one of Cologne’s oldest Churches, St. Cäcilien. Their collection of medieval religious art is exceptional, and their wooden sculptures are unique. We were welcomed by a Canadian Curator and researcher Adam Stead who also gave us an overview of the way in which Cologne City museums are managed. As part of the rationalisation of the City’s collections, the museums have moved round artefacts or collections to show more coherence within the collections. As a French curator in England I found this cultural approach most interesting. We were also invited to visit the bowels of the Museum. A huge lift took us deep down to the storage spaces, including the stone collection store. This was a real privilege for our group of curators. Such facilities would be unimaginable in the small space of Dorchester Museum! Once again, this Museum was of particular interest to me. Despite very little medieval archaeology found in Dorchester, our Museum can trace major developments through the historic records. From the first Norman church to the building of Dorchester Abbey as a monastery for Augustinian canons, Dorchester is today well known for its 12th century Abbey church and its wonderful stained glass and carved stone sculptures. During our free time we were able to visit Cologne’s renowned Cathedral and walk along the banks of the Rhine with its cyclists and “promeneurs”. On the second day we went to the East Asian Museum which revived my personal interest in Japanese art and design. 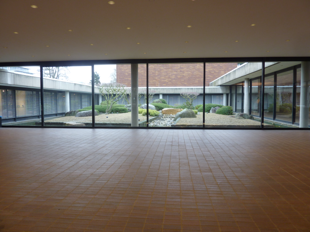 At a glimpse the architecture reminds us of Le Corbusier for its geometrical structure. The renowned Japanese architect Kunio Maekawa (1905–1986), former pupil of Le Corbusier, recreated the perfect Japanese retreat where the inner garden invites you into meditation. The inside rooms merge into the outside spaces, and the Museum display doesn’t disturb this peaceful setting immersed in natural light. We could have spent many hours listening to Dr. Adele Schlombs, the Curator. 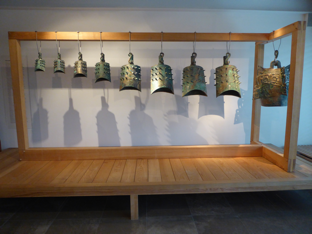 We were travelling through time and suspended Zhong clapperless enigmatic bells, quietly ringing at the tip of the Curator’s finger! Dr Schlombs made us appreciate the beauty and the philosophy of Chinese culture, as well as Japanese art and craft. It was difficult to leave this museum. The journey from Roman times through to Medieval Christian art and the East Asian culture was refreshing. Closer to us in time and consequently even more moving, Käthe Kollwitz (1867–1945) was an artist who focused on the suffering of the poor and left behind by society in the late 19th century. 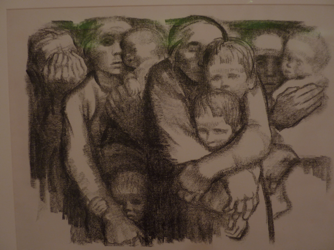 The Museum’s collection of charcoal drawings and pencil sketches shows a very dark human fate and family suffering where mothers were fighting to keep they children safe from political and economic turmoil. Her drawings express the love between mother and child, husband and wife, brothers and sisters and the threat of Death, an unwanted visitor, who is constantly willing to take what is most precious to human kind. The Käthe Kollwitz museum is owned by the Kreissparkasse Köln savings bank. So much to take on board in a few days. This trip was a nice break and a good opportunity to meet museum professionals and share personal experiences as a voluntary curator. Thank you to the SEMF for welcoming me as a new member. I am personally looking forward to next year trip but also welcome our members to Dorchester-on-Thames Abbey Museum !